This image, a collage of photographs taken by the Pan-STARRS observatory, shows the Milky Way stretching across the frame, with 800 million astronomical objects shown in total. It's hard to grasp the sheer amount of astronomical data that came online this week in a 1.6-petabyte data-dump from a Hawaiian telescope, but picture 30,000 Wikipedias or 15 Libraries of Congress. At any rate, it's a lot of information, all thanks to the Panoramic Survey Telescope and Rapid Response System, or Pan-STARRS, telescope in Hawaii. Included in that data are four years' worth of photographs taken by Pan-STARRS's 1.8-meter (6 feet) telescope and 1.4-billion-pixel camera. The upload adds up to 1.6 petabytes, or 1.6 million gigabytes, of data. This is the second installment of the telescope's survey data; the first release, in 2016, totalled 2 petabytes of data. "We put the universe in a box, and everyone can take a peek," database engineer Conrad Holmberg said in a statement. Pan-STARRS is tailored to find what astronomers call transient and variable objects — things that change over short periods of time. That's why it was able to spot 'Oumuamua, the first known interstellar object, as the visitor hurtled through our solar system in October 2017. Other finds include rogue planets, supernovas and quasars. 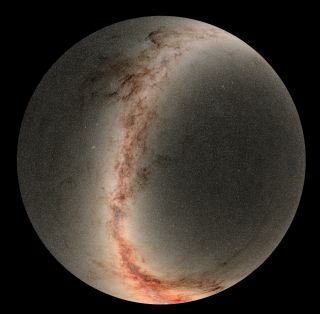 "The Pan-STARRS1 survey allows anyone access to millions of images and catalogs containing precision measurements of billions of stars, galaxies and moving objects," Ken Chambers, director of the Pan-STARRS observatories, said in the statement. "We hope people will discover all kinds of things we missed in this incredibly large and rich data set."